My friend of many years, Michael, who has drilled more boreholes than he can remember, sunk yet another borehole at Tremisana. Water was obtained at a depth of 55 metres, but I was advised to continue drilling. Eventually we drilled down to a depth of 110 metres. The reason given by this gifted doyen of water diviners was that an El Nino is expected within the next 12 months. I hope he is wrong. The effects of the shortage of water are already worrying. 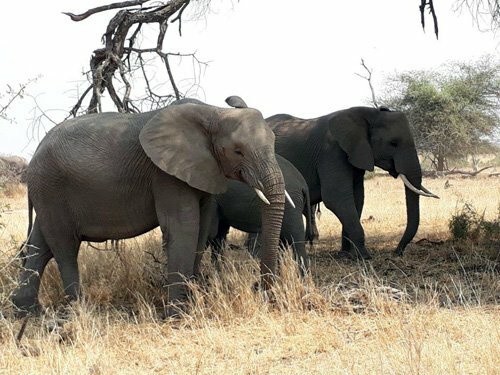 Animals are traveling great distances to find food; Tremisana Lodge is being broken into daily by desperately hungry warthogs and elephants are boldly destroying the vegetation planted on the periphery of Tremisana. 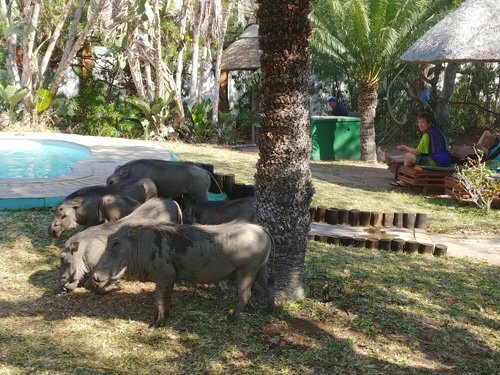 Warthogs at pool area of Tremisana. The fact that Tremisana Dam is now the only dam that has water in our area is good for our tourists as there is a regular movement of many animals every day. We have also seen some fantastic water birds at Tremisana Dam : Saddle-billed Stork, African Spoonbill, Yellow-billed Stork, Knob-billed Duck and Egyptian Goose. Elephants at waterhole in front of Tremisana Lapa. In Kruger Park, the Nsemani Dam is empty and the only dam with significant water is Ximangwanana Dam where large herds of buffalo and elephant seem to be always present. Game viewing in Kruger has been excellent – on the day I went to Kruger for my monthly admin purposes we saw the Big Five and Cheetah. 9th September : On Barnard we found a pride of lionesses with seven cubs of differing ages. On 12th on Rome1 on the bush walk we found a breeding herd of elephants. They were all around us and the guests were happy but also a little scared. The elephants were relaxed. Later we found a mating pair of lions. On the 17th at Tremisana Lodge there was a herd of bull elephants as we approached our open vehicle. We started our game drive with them. 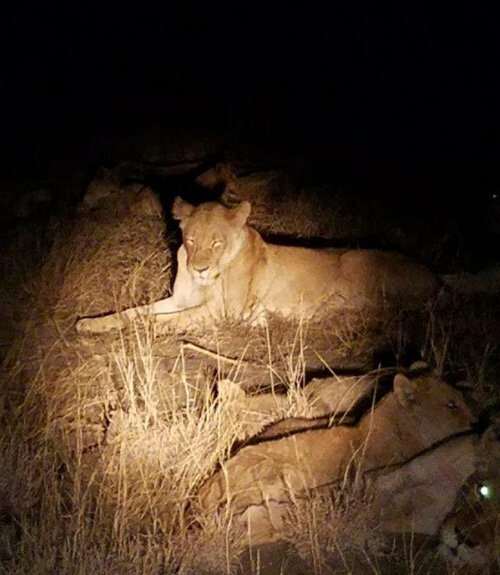 On the 18th we found 4 lionesses hunting. On the 24th on Rome1 on afternoon walk with sleep out guests within 50m just in front of us we saw a leopard catch a squirrel on a tree !!! First for me !!! On the 27th at Ximangwanana dam there was lots of game all in the same place – we saw four out of the big five simultaneously – only leopard missing. All the general game was there – great place to go. 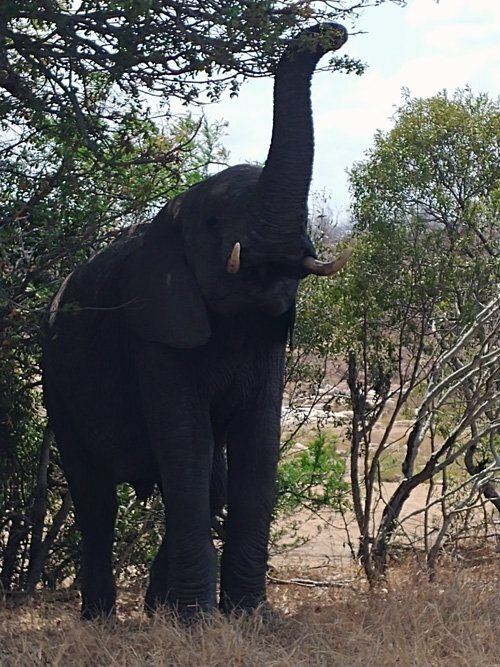 Elephants are being seen in their hundreds in Kruger Park. Game viewing has been fairly good with regular sightings of elephant and buffalo near Marula Boma. Hippo and crocodile are seen along the Olifants River. 2 black rhinos are seen fairly often. My best day started with a bushwalk where we saw a bull Black Rhino named Zulu, a breeding herd of Elephants and we saw hippo and crocodile out of the water. During the Sunset Drive we saw a black rhino cow with a calf and a pride of 20 lions. 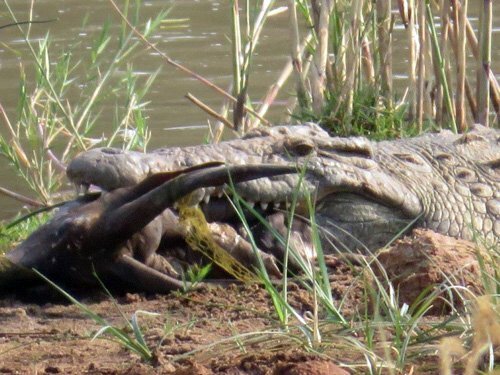 On another bush walk we found a large crocodile attempting to swallow a Bushbuck ram – excellent and most unusual sighting. Large Crocodile seen on bush walk attempting to swallow Bushbuck. Conditions in the Bush at the moment are very dry. Animals are under Nutrient Stress. Temperatures are getting to 40+degrees. Main water sources are dried up and animals have to move further for water and food. Together with Patrick, I went into the park and found a female Leopard not even 2km in. She was young and skittish. She was busy scent marking vegetation for maybe 15 seconds and walked further off into the bush, A big African Elephant bull was seen next, eating away. Further on we spotted 2 White Rhinos. Along the Timbavati River bed, we spotted Dagga boys (Old Male Buffalo) at the water relaxing peacefully. Make that 4/5 – only Lions missing. Bird species seen included African Fish Eagle, Saddle Billed Stork, Tawny Eagle, Kori Bustard, Southern Ground Hornbill and Martial Eagle. At Nsemani Dam we found an entire pride of Lions relaxing across the dam with about 16 cubs. Fantastic Day…Thank you Kruger. Coming into Kruger the next day, we saw 2 Big Elephant Bulls very close. Just after Orpen Shop, we saw a big breeding herd of Buffalo lying down close to the waterhole. Getting to S100, we found a pride of Lions on the road as relaxed as can be…We spent a whole 40min with them!! After lunch, we got a Rhino and a female Leopard just before the last boom gate. Great day with Big Five once again. Bush Walks have yielded hippos and crocodiles. The bush will always surprise you – I was doing my sunset drive so I briefed my clients before we left Tremisana. It was quiet so that you can think that there’s nothing but nature is always full of surprises : we saw a black rhino coming towards us. Everybody was very happy to see that. We went on and we saw lots of impalas and a grey duiker. When we reached Marula Boma we saw a hyena walking around the place – my guests were enjoying themselves – hakuna matata. My sunset drive was amazing, I went to Campfire and we saw lions : two males and 4 females and some cubs. On Motlala we managed to find a really cool sighting of an Aardvark – an animal very seldom seen in the bush. We also had black and white rhino sightings. In Kruger we managed to find elephants and buffaloes right at the waterhole at Orpen shop so that was a good start. 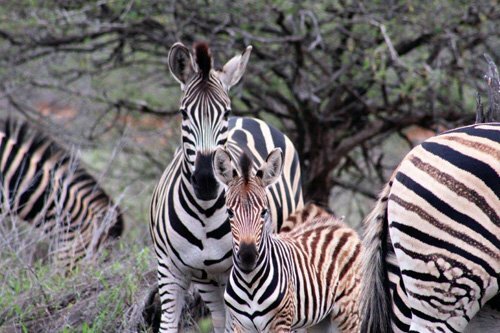 We then found a rare genetic mutation in a zebra that made it orange in colour not from a dust bath but was born that way. On the s100 we found some lions and we were updated of 7 lionesses on a zebra kill not far away. When we arrived we had them walking past our vehicles nice and close. After lunch with the temperature hitting 44 C degrees we managed to find a rhino hanging out in the shade as well as 2 male lions that had killed a impala. We now only had one more to tick off the list. On the way back we managed to spot a small female leopard lying in a dry river bed trying to get out of the heat. I could not have asked for a better day. What a great month filled with sightings of the big five as well as general game. It has been very dry in the bushveld but nevertheless Nature always seems to have surprises around every corner. The few I have done have been a great way to wake up and get the day started with sightings of elephant, lion and general game. Giraffe zebra impala and kudu always waiting to welcome us to a new day as well as a farewell sunrise to our guests that have spent a lovely time with us. Staring into the beast’s eyes – my breath taken away and a feeling of calm as a male lion stood next to me while I was on the tracker seat – glaring into my eyes on our way to our bushwalk area – an experience I will never forget and cherish for a lifetime. Our usual hippo and crocodile sightings at the Olifants River where we conduct our walks. Giraffe elephant and surprisingly one bull black rhino. All encounters were perfectly conducted and our guests had an amazing time becoming one with nature and enjoying what she has to offer. 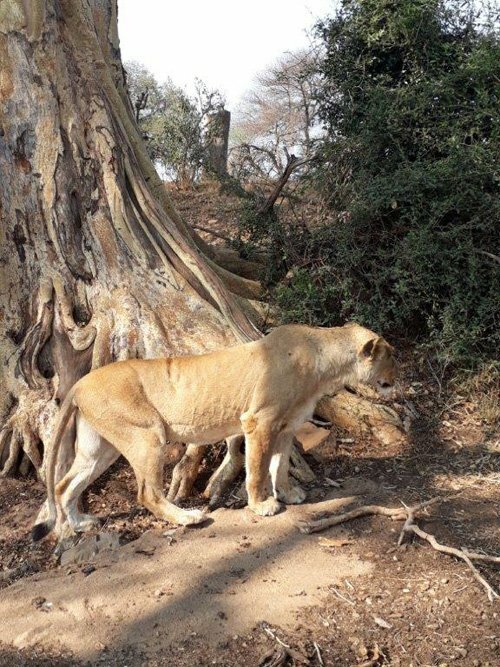 Drives have been scorching hot but sightings have been beautiful with herds of elephant playing in the river, rhino making their way through the bush as well as lion sightings lazing it out in a cool riverbed waiting for the heat of the day to subside. This is a drive I enjoy as it is always a blessing to see that even midday surprises are lurking around the corner. By far my favourite drives as I get to share quality time with my guests and give them the beautiful experience of covering the area from the afternoon to the evening as well as share an absolute breathtaking sunset with provided snacks and drinks. On these drives this month we have experienced big herds of elephant; prides of lions; rhino and other general game including the giraffe and zebra that our guests so dearly enjoy. Drives can be quiet and our guests are sometimes exhausted from the long trip from Johannesburg but always a pleasure to see the excitement in their eyes as they board the safari cruisers. From Pride of lion with cubs to herds of elephant surrounding the vehicle; rhino passing the vehicle to masses of giraffe luring around feeding to the nocturnal creatures coming out such as genets, porcupines, honey badgers and hyena at Marula Boma where we have our dinner under the stars – a truly beautiful setting that is bound to take anybody’s breath away. Overall it has been a moderately good month and sightings have been decent. The area is dry but with the first rains on their way it is bound to flourish green all around bringing even better sightings ahead. We started our game drive at Orpen boom gate and it was a beautiful day. We saw a lot of general game including beautiful kudu bulls and close-by giraffes. Further on we saw three white rhinos next to the road – it was a beautiful privilege. On the S 106 road we saw a male lion crossing the road between our open vehicles and back on the H7 we saw buffalos and elephants sharing a wallow. On the S100 we saw six lionesses lying down near the road – it was a beautiful sighting. After lunch at Satara, we took H1-3 to Sweni – loads of general game. On the S36 we saw a spotted hyena crossing the road running down to the bushes with blood on its mouth. The best was left for last : on our way out we saw a young male leopard !! Our guests was very happy because we had seen all Big Five in one day ! Viva Viva Safaris Viva !!! 3rd of September : It was a hot day, sightings good, cheetahs at the first Orpen boom gate and elephants before reception, buffalos at Orpen Waterhole, Lions on h7 Timbavati riverbed, White rhino somewhere there ( GM gets cross if I give exact location ); more general game s100 road and more lions Xibotwana windmill. 7th : Leopard before reception, elephants and buffalos Timbavati riverbed, cheetahs crossing the road at Girivana road, Lions Nsemani Dam. 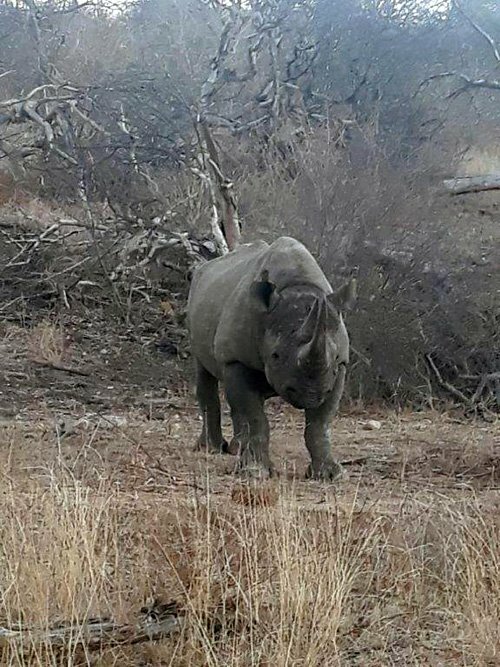 18th : sightings good, Lions H7 and on Ttimbavati riverbed, elephants Nsemani dam, plenty general game s100 and leopard on s39 road, white rhino. 25th : Lions on s106 and Rabelais road and Timbavati riverbed; buffalos Nsemani dam, more lions Xibotwana windmill, elephants s100, leopard the first view point on h7. Great day again! 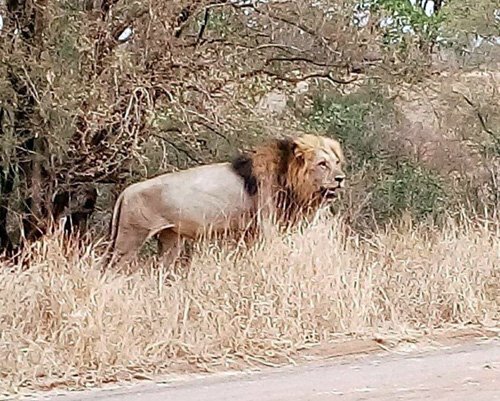 26th: sightings good : lions s100, white rhino somewhere, buffalos h7 riverbed and Timbavati road, a lioness at Girivana road, cheetahs also Girivana road and Hyenas on h7. TREMISANA LODGE has had numerous animals all around us. The Tremisana Dam is the only water source besides the Olifants River which is 7 km away so there is much game activity. At night we see Hyenas, Civet, Porcupine, Genet and Bushbaby drinking at the illuminated waterhole in front of our Lapa. With the heat becoming unbearable we have installed overhead fans in all our staff rooms. MARCS TREEHOUSE LODGE has experienced an increase in numbers of Nyala, Impala, Bushbuck and Kudu. The buffalo herd comes around regularly but are located on other parts of Motlala Reserve where we are feeding them. Unlike Tremisana which is part of Kruger Park and animals are free to move wherever they want to, an enclosed reserve such as Motlala needs to supply extra feed for the large grazers such as Buffalo and White Rhino. KATEKANI continues to grow in popularity and I maintain that, of all 23 products Viva Safaris offers, the Katekani options offer the best value-for-money. Thanks to all your support, we have had a record number of tourists this September! Invariably with such thoroughfare, there will be the odd glitch. Unfortunately our electricity supply relies on the national grid. With the sudden big winds we had during this month there were times that we had no electricity – one morning we had to wait for the boreholes to supply water. The electricity supply fluctuates and the sudden change in voltage from 220V to 120V can cause problems to electrical appliances – we have had to replace 2 air conditioners. 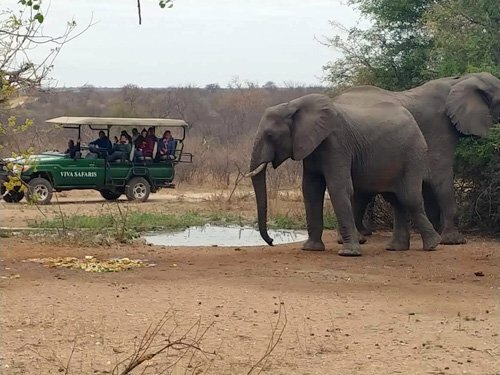 The vast majority of our guests accept that this sort of thing may happen in the bush – the whole area, not just Tremisana suffers – and generally our tourists take it in their stride. At Marula Boma I have engaged my good friend and former Warden, Wynand Britz, to install solar electricity. Perhaps that is the way to go with all our places. With all the tourists coming to Marula Boma we have added another bathroom as well as other useful buildings. We have missed only 3 days ( two in May and one in June ) out of 365 this year in which we did not / shall not have a departure with guests traveling from Johannesburg – this means that we shall have used Marula Boma 362 times this year- an unbelievably brilliant statistic. I have no doubt that all our budget-conscious tourists see exceptional value in all our products and this is why we are so busy. Our business helps to alleviate unemployment in the region. Brilliant Holiday experience-just loved it ! Just returned from a twelve day holiday package with Viva Safaris. Thank you everyone for making my trip so special. The game drives were my absolute highlight and I was fortunate to see the big five, cheetah, wild dogs and so much more! I stayed in all three accommodations. Tremisana is small and friendly with comfortable but basic rooms. Marc’s Treehouse is a camp of huts built on stilts with reed walls, wood planked floors and thatched roofs situated in the bush ( there are tents too although I did not see them) – rustic and simple – I loved my treehouse – no 7 ( with ensuite!) with a balcony/ deck which had a beautiful view of the river where the animals came to drink late afternoon. Monkeys ran over my roof and often peered at me curiously through the window to check if I had snacks lying around ( yes they often break in). Most of the treehouses appeared similar to mine but are different sizes to accommodate more guests. Some like mine are quite far from camp- others closer. Honestly it really is a great bush experience and I’d recommend trying it. If you have mobility problems ask for treehouse very close to the bar . There are only two actual treehouses built very high into trees which have separate toilet facilities on the ground so that wasn’t for me! So if you want one of those book ahead and request it. For the final four days I stayed at the Katekani luxury tented camp. The accommodation is part tent/ fixed wall/ thatched roof but extremely nice! My room was enormous and beautifully appointed with indoor and outdoor shower ( even a fridge and kettle!) with a huge private deck and plunge pool. A huge thank you goes to the wonderful staff at all accommodations for looking after me so well, especially Pretty and Tande at Tremisana, Ruth, Alfred and Richard at Marc’s and Magrett and Nomsa at Katekani. 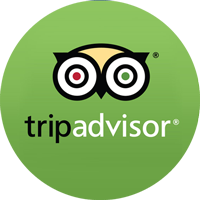 It is the warmth and genuine friendliness of every single member of staff that made my holiday experience so special. They all went above and beyond what was expected of them. Thanks also to the expert and dedicated rangers who were both informative and enthusiastic on every single game drive! Rex, Raymond and Eva at Tremisana and Charl, Patrick, Nico, Victor and Harrison at Marcs /Katekani you were all fantastic thank you. If you are considering a safari, are happy to be based an hrs drive from Kruger, Viva offers excellent value for money. My advice is stay longer than three or four days. The transfer from jo berg takes up the first day and the return is the same so if time allows do at least the five/six day package. Do bring warm clothes for the morning and evening transfer from camp to Kruger as it takes approx an hr each way and can be cold in winter and early spring. It is a cash bar so ensure you bring enough as there are no atms in the bush! You def need a torch for the evening as it is dark walking back. All in all I had so much fun that I hope to return! Katekani is simply great. It is situated alongside Kapama inside a reserve. Rooms are huge, with outside and inside shower, huge bed, all comforts. All rooms are well furnished, we fell in love at first glance. If you are thinking about a place crowded with people… well you are totally wrong. Rooms are surrounded by the bush and the closest person is at more than 100 meters of distance. From our rooms we saw monkeys and antilopes and slept with lions’ roars near to us. Dinner and breakfast are served in a common area and it is great to stay at the same table with the other hosts. Food was very good. Piero and his team did a fantastic job. We saw the big 5 twice. But more important, with Charl and Elias we looked for the animals in a respectful way, without being aggressive just for the sake of being closer to them. We also learned a lot about the animals and life in the bush. Last but not least, I believe quality for price was simply great. We loved our time at Tremisana, the rooms were spacious and clean, and the area was beautifully maintained. We were welcomed at the front gate by an elephant and monkeys (before heading into the secure area), which was an awesome start to our trip! We will definitely be recommending Tremisana to friends and family, as the experience is amazing, and incredibly good value for money. Marc’s treehouse is a great place with monkeys and impalas roaming around. The facilities are pretty good if a tree house is to your taste. Our hostess Ivy is a well-organized, warm-hearted, and gracious host. Every day she made sure we know our itineraries beforehand even with multiple groups having different activities next day. The food was wonderful. There’s even a chance to try out some impalas if you’re lucky.